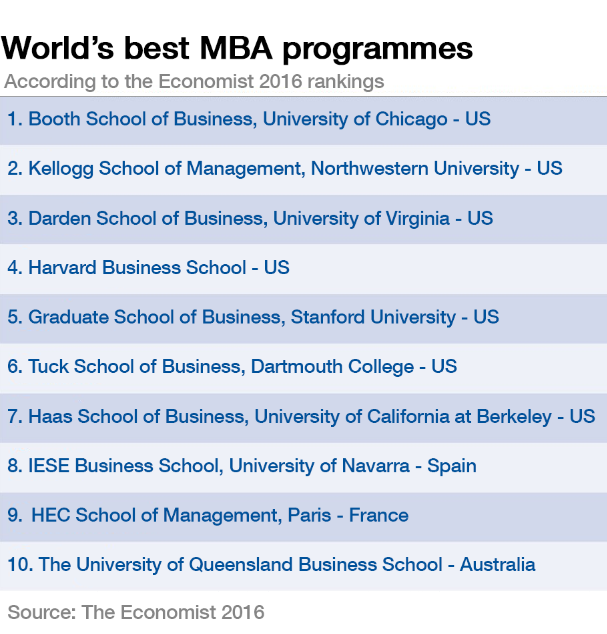 Although US business schools dominate the top 10, there are new entries. The Booth School of Business has once again held on to its place at the top of The Economist’s ranking of the world’s best full-time MBA programmes. The school, based at the University of Chicago with campuses in London and Hong-Kong, has taken first place every year since 2012. Now in its 14th year, The Economist’s WhichMBA list rates MBA programmes under four main categories: ‘opening of new career opportunities’; ‘personal development and educational experience’; ‘increase in salary’; and ‘potential to network’. The Booth School of Business, which takes on 585 students each year, ranks highly in the ‘opening of new career opportunities’ category and comes first for ‘personal development and educational experience’. Next on the list is Northwestern University’s Kellogg School of Management, which has been steadily climbing the rankings since 2011 when it began a seven-year plan for transformation. Darden School of Business at the University of Virginia dropped one spot from the previous year to third place, while Harvard Business school retained last year’s fourth-place ranking. Although US business schools dominate the top 10, there are new entries from Asia-Pacific and Europe. The University of Queensland Business School climbed six places and broke into the top 10 this year. It celebrates a record five years as the leading MBA provider in the Asia-Pacific region. The Economist ranked the Australian institution number one for ‘post-MBA salaries’ and for ‘student quality’, but lack of ‘student diversity’ and ‘internationalism of alumni’ lowered its overall ranking. The University of Navarra’s IESE Business School also improved its ranking this year, reaching eighth place.